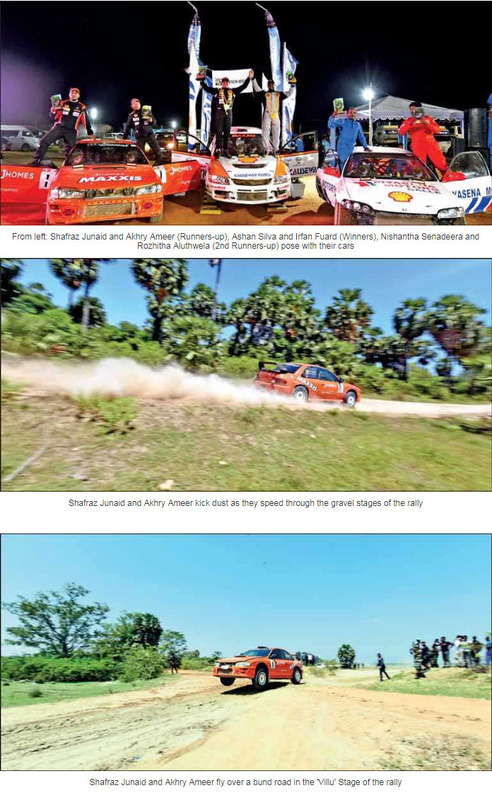 The Maxxis Xtreme Racing cars stamped their force in rallying when they emerged winners and runners-up at the Northern Speed Rally 2019 concluded at the Jaffna Municipal Grounds yesterday. Ashan Silva with co-driver Irfan Fuard clocked a total time of 1:05:29.718 seconds in their Mitsubishi Evolution, while Shafraz Junaid and co-driver Akhry Ameer clocked 1:11:00.838 seconds respectively for a perfect podium first and second at the inaugural Northern Speed Rally 2019 held on 23rd and 24th March 2019. An impressive line-up of 13 motor vehicles and 10 riders started off on this event with just two retirements. The drivers and riders comprised some of the most notable names in Sri Lankan motorsports, while the riders included a team from the Special Task Force. Yet another notable participant was Sri Ram, a motorcycle rider from Jaffna. The competitors having made their way to Jaffna went through a recce of the five different kinds of stages during the day on Friday 22nd March 2019 before donning their race kits for the ceremonial start and a super special stage to entertain the spectators the same evening. Thereafter, they raised dust in the gravel stages in Iyyakachchi area throughout the weekend before returning back to the town for the ceremonial finish yesterday. “We commend the organisers for making the effort to organise the first speed rally after a lapse of three years and we are happy that we were welcomed by supportive people in Jaffna. The stages were of a good surface and was fast, we really enjoyed driving,” said Ashan Silva on his victory. Ashan Silva led the leader board from the beginning, while Shafraz Junaid had to cope with some brake issues before settling into his runner-up position by the next morning. Maxxis tires also had a 2nd runner-up position in the Trucks and Jeep category after a hard fought battle for second driven by Amjad Rivi with his co-driver Azad Ziaffuddin. The Northern Speed Rally was organised by MRA (Motor Racing Association) in association with the Sri Lanka Army Motorsports Club and was promoted by the Jaffna Motor Sports Club.